Twenty years ago, Silversea began offering luxury cruises with just a single ship. Now, they have a fleet of eight, comprised of five classic luxury cruise ships and three dedicated luxury expedition vessels. So far, I’ve sailed aboard two of their expedition vessels – once in the British Isles aboard Silver Explorer, and this past May aboard Silver Discoverer in Australia’s remote region known as The Kimberley. On each voyage, I have been struck by the depth of Silversea’s expedition itineraries and the sheer number of experiences that can be rolled into just a few short days; things like hiking on deserted islands, flying over mountain ranges or enjoying sunset cocktails on a sandbar in the middle of the ocean. These are journeys where guests were up before dawn on certain days and turned in well after midnight. They’re busy, active voyages – but when the hard work ashore is done, Silversea’s signature luxury kicks in. There’s nothing like coming back to the ship after a long day of exploration to a cold towel and a fresh cocktail waiting for you, all complimentary. Now, I’m ready to tackle another Live Voyage Report adventure: The Galapagos Islands aboard Silversea’s second luxury expedition ship, Silver Galapagos. 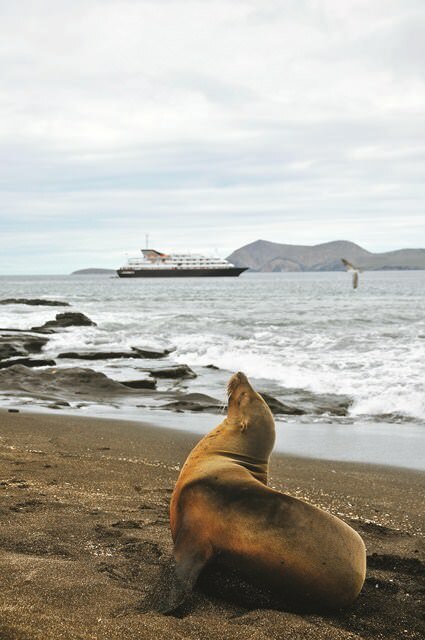 Silver Galapagos sails both Western (pictured) and Northern Itineraries. Did you know that, due to Galapagos regulations, ships cannot call on the same port twice in 14 days, hence the two itineraries? Illustration courtesy of Silversea. 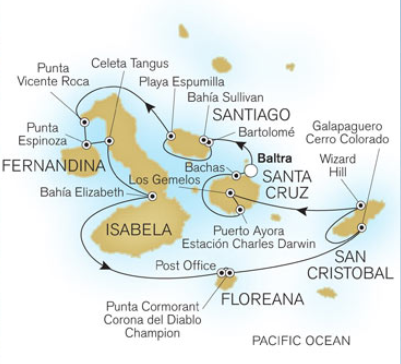 Saturday, October 11, 2014 Baltra / Guayaquil, Ecuador Disembark Silver Galapagos in Baltra; fly to Guayaquil, Ecuador & return journey. Normally, both Northern and Western Silver Galapagos itineraries operate roundtrip from Baltra, but our special voyage begins in San Cristobal – for good reason. For the month of September, Silver Galapagos will undergo a month-long refurbishment that will better align her with her luxury expedition sisters, Silver Explorer and Silver Discoverer. Areas scheduled to be refitted include all suites, passenger corridors, and the Explorer Lounge. Silver Galapagos was refitted prior to entering service with Silversea last year, and will be refitted again this September to better align her with her luxury expedition fleetmates. 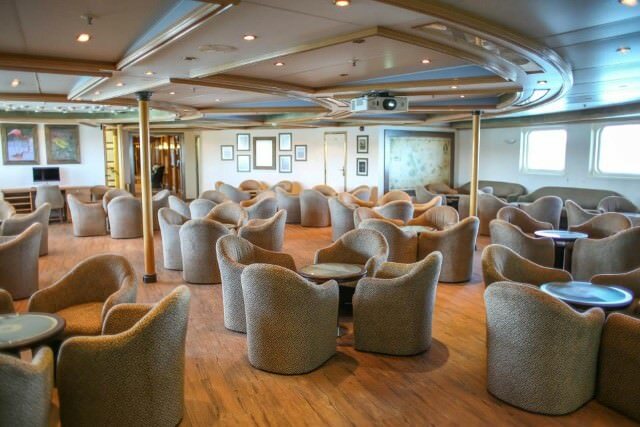 Pictured here is the ship’s Main Lounge, prior to her refit. Photo courtesy of Silversea. Just in time for her first anniversary, Silver Galapagos will feature a new elegant blue-and-beige colour scheme that was developed for the Silver Discoverer. The new color palette also helps to act as a differentiator from Silversea’s classic fleet of ultra-luxury cruise ships, many of which feature hues of red accented with Art Deco shades of green, brown and beige. Once the refit is complete, Silver Galapagos will sail for San Cristobal, where her guests will embark on Saturday, October 4. Silver Galapagos carries just 100 guests – the maximum allowed on a single vessel in the region under Ecuadorian regulations. But considering she’s only 289 feet long, she certainly manages to pack a lot of features in, like a full restaurant on Deck 2; two separate lounges situated all the way aft on Decks 3 and 4; a small library and boutique; a fitness centre and spa; and perhaps most importantly, The Grill, Silversea’s signature “cook-it-yourself” hot rock dining experience that was pioneered aboard the much larger Silver Spirit. 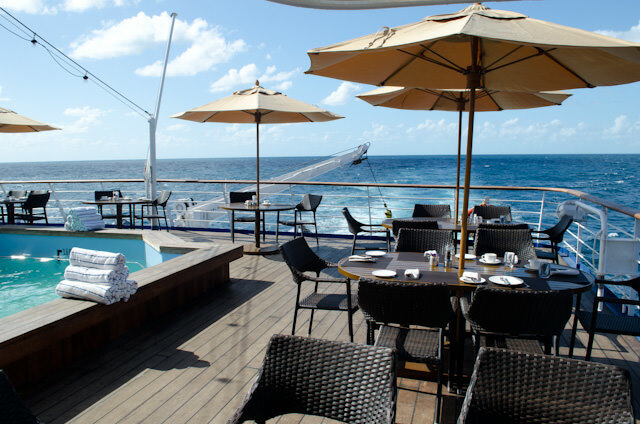 It’s popular on Silversea’s classic fleet, but dinner out on the Pool Deck aboard Silver Discoverer at The Grill was one of the hottest tickets around. Thanks to her days with Renaissance back in the 1990’s, her staterooms and suites have a decided elegance already built-in. The smallest accommodations, the Explorer Suites, measure between 210 and 250 square feet and feature either view or porthole windows. At the top end of the scale are the Silver Suites situated on Deck 6, which come in at nearly 400 square feet and include a balcony. They’re on the small side when compared with the classic fleet, but they’re plenty big in the world of expedition cruising. Silver Galapagos may be a luxury expedition ship, but she’s also a working expedition ship. Silversea’s Expeditions arm sails to a lot of “bucket list” destinations, but the Galapagos Islands have to be one of the most exotic. My Moon Galapagos Islands Handbook even comes with the heading “Trip Of A Lifetime” printed just below the title. They’re also not easy to get to: I’ll travel from Vancouver to Seattle to Miami to Quito to San Cristobal in order to join the ship. The best places I’ve been to, however, are typically the ones with the fewest direct flights. The Galapagos is made up of 13 volcanic islands and over a dozen smaller islets. As of 2010, the permanent population on the islands was a mere 25,000 inhabitants. One very cool port on my Western Galapagos itinerary is Post Office Bay, where travelers have been leaving letters for pickup by the next ship since the 18th century. Guests can also chose to snorkel at the center of the submerged crater at Devil’s Crown, or explore the abundant wildlife at Bahia Elizabeth. 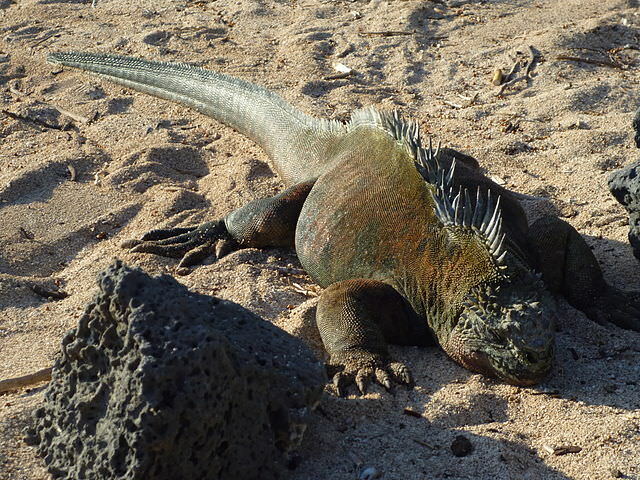 The wildlife is a huge feature of these Galapagos itineraries. Many animals can only be found in this part of the world, and these helped inspire Charles Darwin’s theories on evolution as detailed in his book, The Voyage of the Beagle. Today, the Galapagos has also been designated as a UNESCO World Biosphere Reserve in 1987 due to its unique and abundant sea life. Still, the regulations for operating in the Galapagos are stringent. UNESCO placed the Galapagos on its list of endangered World Heritage Sites in 2007, and operating a ship here is far from easy. Strict regulations govern goods that can and cannot be imported to the islands, and passengers can expect to undergo rigorous luggage searches when arriving from the mainland. Fortunately, Silversea minimizes its footprint by equipping their Expeditions with reusable water bottles for use ashore and in staterooms. Plastic bottled water is never seen, reducing the amount of waste onboard. What’s more, every Galapagos itinerary includes a visit to the Charles Darwin Foundation so that guests can become better acquainted with some of the unique conservation issues facing these islands today, and about the importance of protecting them for future generations to enjoy. 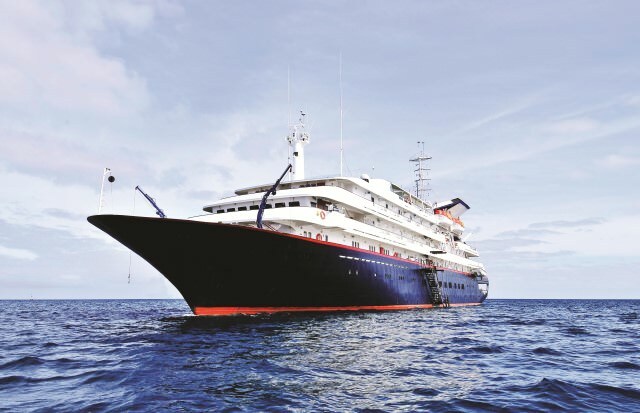 With Silver Explorer operating mainly in the polar regions of the world, and Silver Discoverer operating in the Pacific, Silver Galapagos makes her home exclusively in the UNESCO World Heritage Site that is her namesake. There’s not a lot out there about the ship or the itinerary at the moment – but I look forward to discovering what makes both tick! 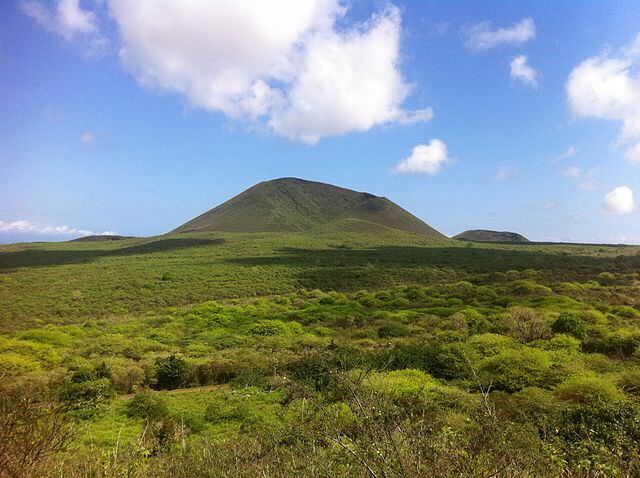 Our Live Voyage Report from onboard Silversea’s Silver Galapagos runs from October 3 to October 11, 2014.